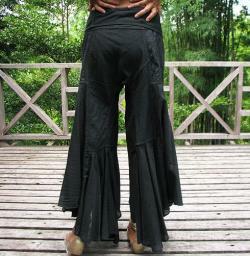 An adapted version of "flow fisherman pants". Quality mix silk fabric with great flow. It feels great on the body. We patch the top part with pleated fabric to get interesting texture. 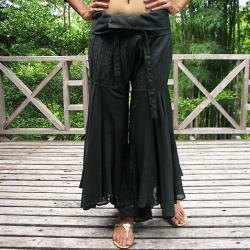 The top part is a wrap and fold style like fisherman pants. The bottom part we use lots of fabric cut on the bias to get the flow and the ruffle in the flamenco skirt style. Tie goes around from the back so you can adjust it to fit you just right. Guarantee high in comfort and style. Please check this link for instruction of how to put them on. 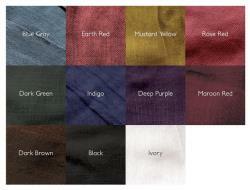 Material; mix silk contain 75% cotton/15%rayon/10% raw silk. Feel comfy like cotton, with luxurious shine like silk. Care instruction; treated like delicate cotton. Machine wash cold, tumble dry low, hang to dry in shade. Avoid very strong sun when dry. Waist unwrap 42" (fits best for waist 24"-37). Bottom hem is approx 3 meters around. Waist unwrap 48" (fits best for waist 26-40"). Lenght unfold longest part 41", shorest part 35". (for your reference model is a size 4-6 us and 5'4 tall and she wore size s-m in the picture). If you have some specific request or special character such as broad shoulder, long arms, long waist, etc you think we need pay attention to when making, do let me know. Warning : our all colors in listings could be looked differently in the range of 20% from the real colors of cloths because of picture works which were not professionally done. Besides our any white color is not bleached one. We respect the comfort of wearing so that we use natural white which looks more ivory. Even if our listings pictures look very white, actually it is never bleached white. Please accept these color complexities. Don't hesitate to contact me with any questions, i'd love to help. Our usual turn around time is 2-10 days. Your package will be sent as soon as the item(s) are ready.